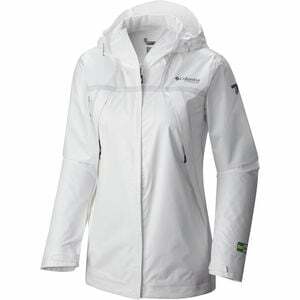 Product Condition: The Titanium Outdry EX Eco Jacket - Women's is in Excellent condition. This jacket is made of a rubber like material. It has some scuffs in the material if you look real close. There aren't any defects though and the item is very lightly used. Waterproof outerwear has traditionally relied perfluorinated compounds (PFCs) to bead off outside rain and moisture, causing undue damage on the environment through bio-accumulation in natural ecosystems, wildlife, and even humans. Solving outerwear's dirty problem of toxic byproducts, the Columbia Women's Outdry Ex Eco Jacket employs an innovative design with all-recycled, dye-free materials. Best of all, it doesn't rely on harmful PFCs for water-beading performance and saves 21 recycled plastic bottles from ending up in the landfill. The OutDry Ex Eco bucks the norm of traditional outerwear by placing the waterproof membrane along the outside of the jacket, instead of using a face fabric with a water-resistant coating comprised of toxic PFCs. This innovative construction technique repels water long after traditional jackets would become soaked along the face fabric, what's referred to as wetting out. As a side effect of never wetting out, the membrane is consistently able to pass sweat through its microscopic pores. Ultimately, this means it's less like zipping into a sweaty garbage bag and more like a climate-controlled rain shelter.